Angela Manders has sent me some photos of her Moss / Holton family, including this group. She says lady in the centre is Elizabeth Linford née Holton, (1839-1917). The youngest lady seated at the far left of the photo is her youngest daughter Elizabeth (1884-1964) whose husband William Ridgway is standing behind her. Another daughter, Caroline (born in 1876), is seated at the far right of the photo. She married Joseph Moss in 1901 in Peckham where they continued to live – again, he is standing behind his wife. We know that daughter Elizabeth jnr. (identified by Angela as sitting at the far left of the picture) married William Ridgway five days after Elizabeth snr’s birthday, on 19th April 1909, so – since William is standing behind Elizabeth in the same way that Caroline’s husband stands behind her – I think this photo is unlikely to have been taken more than a year or two before that. Elizabeth jnr. would have been 25 in 1909: again, her appearance agrees more or less with that date. I then wondered if it might be a gathering of the family to celebrate Elizabeth’s 70th birthday on 14th April 1909, with a second celebration (of Elizabeth jnr’s marriage) to come a few days later. Three of Elizabeth’s surviving daughters still lived in the Buckingham area (Caroline – sitting at the right of the photo – was living in London). The lady in the white blouse beside Caroline looks a bit older and might be Emily, aged 39: but where is Esther (aged 31)? Perhaps she is the smiling lady behind the man (presumably her husband, James Linford) seated with the child. The man in the centre, standing behind Elizabeth, could be Elizabeth’s middle son Joseph, aged 35, whose marriage to Minnie Steeden might already have failed – by 1911 she was living in Nottingham; later she worked in Canada and only returned to England a few weeks before she died at the end of 1934. Does anyone have any photos of any of the people mentioned to help prove or disprove my theory? on the road, near the turnpike at Tingewick. about half-past nine o’clock, without any person in it. gave the alarm of the deceased having been found. to the nearest public-house for the purpose of inquest. what he had with him when he left home in the morning. Side, who was in Brewerton’s house. deponent went to call John Brewerton to fetch Benj. dence generally came from him very reluctantly. at Finmere, but the house is in Tingewick parish. Monday evening the 25th ult. about 8 o’clock, Wm. and appeared perfectly capable of going home alone. Brewerton had left the house some time. direction of the Coroner, of Accidental Death. Does anyone have any photographs taken by William Charles Kingham of Tingewick? If so, I’d love to hear about them. His father, Joseph Kingham was born around 1855 in North Marston, a dozen or so miles south-east of Tingewick in Buckinghamshire. He married in 1877 and had three sons by 1884. He was a coachman in Quainton and Maids Moreton; then, in 1898, he moved to Tingewick to take on the tenancy of the Royal Oak. That same year, William Charles Kingham – his oldest son – married Tingewick girl Fanny Amelia Steeden. He described himself as a ‘cycle agent’ in the marriage register, but at the census two and a half years later he is a ‘photographer and cycle dealer‘. I have one of his photographs- of Frank Floyd, at Wood Farm, looking splendid in his Bucks Yeomanry uniform. Then, a few weeks ago, I had an email from Vic in Hampshire, asking for help identifying the people in a family group. The smart young man with the bicycle in front of the same cottage is his grandfather, Charles Smith (b. 1885). Could the others be relatives? 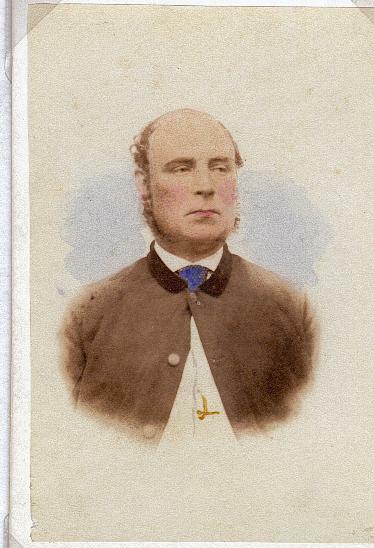 His grandfather’s grandfather was Tingewick labourer Edward Smith (1818-1853) who died in his mid-thirties, leaving his widow with six children to raise. Vic is descended from the youngest, George (b. 1848), who moved to London. The older siblings dispersed to Oxfordshire, Staffordshire and Cheshire, leaving just their oldest sister Ann (183-1911) 1in the village. Her daughter Harriet (b. 1856 and Vic’s grandfather’s oldest cousin) married Richard James Coates (1858-1915) who plied a variety of trades in the village – painter and glazier, plumber, even grocer – before settling – by the turn of the century – as a ‘house decorator‘. On the 1901 census, he and his six children are a near-perfect match for the group in the photograph above which probably dates from around the same time. Meanwhile, Charles Kingham’s photography business seems to have been a sideline to his main bicycle sales and repairs – it doesn’t appear in the local Kelly’s Directories where he is listed as a cycle agent and cycle repairer. At some point after 1907 he moved to Stantonbury, now part of Milton Keynes, with his wife and two children. In 1911 he is recorded there as an electrician’s labourer in the railway carriage works. A year later, Fanny died; he remarried in 1915; and he died in Northampton General Hospital in 1948 without – as far as I know – continuing his career as a photographer. Or does anyone else know differently? wife a daughter of Ebenezer Newman Pollard. Albert John Aris, ‘Canteen Steward’, born 1880, son of John and Maria (Greaves): Royal Garrison Artillery: signed up 13 Oct 1914: discharged (having been promoted several times, finally to rank of Sgt) 26 June 1919. He must have been an impressive sight – relatively tall at 5 ft 10½ and weighing 182 lbs when he enlisted, he had a 42 in chest and a number of tattoos – “flags on inside of left arm, & figure of General Butler on forearm & faith home & charity, also figures on right arm, Lord Kitchener &c”. He appears to have joined the army for 6 years in 1898, which he extended for a further 6 years in August 1905 while serving as a gunner in Gibraltar. He also served in Sierra Leone, South Africa and Malta, finally discharged from the regular army in 1913, after nearly 16 years’ service, during which he had been promoted to Bombardier but had reverted to Gunner at his own request! Thomas George Barnes, labourer, born 1880, son of Joseph and Mary Ann: enlisted 10 Nov 1914 but two weeks later: “Discharged – not being likely to become an efficient soldier under para 392(111)(c) Kings Regulations” – signed by the colonel commanding the 8th Battalion Oxford and Bucks Light Infantry. He appeared before a medical board but there is no record of any physical disability. William Ambrose Cross Neale, shoemaker, born 1879, son of Elizabeth Neale enlisted 30th June 1915 in the Army Services Corps. His army record shows his ‘physical development’ was ‘poor’ and he wore glasses. He sailed to France aboard SS ‘Lydia‘ in July 1915 and joined 16 Labour Coy at Rouen: he was absent from roll call in November and lost 3 days’ pay. He was invalided to England (T.S. ‘Panama‘) on 12 March 1916 and admitted to Manchester Western Hospital suffering from ‘Debility‘ caused by diarrhoea and vomiting, and with sleep problems. Six weeks later he was discharged from hospital with his weight regained and sleep improved but on 21st June 1916 he received a “Discharge being no longer physically fit for work” and was awarded a pension of 4/8d per week. His medical notes also show that he had a slight heart murmur. objectives and leading them forward. a very fine example to all about him. Reginald George Benjamin Steeden, farmer, born 1884, son of James and Jane (nee Paxton) enlisted at Bletchley Recruiting Office on 14 December 1915 and was appointed to the 96th Territorial Reserve Battalion – perhaps because of his occupation. However, he appears to have seen at least one spell in the British Expeditionary Force at the end of September 1917. James Arthur Stuchfield, railway porter born 1891, son of George and Elizabeth (Lucas) joined the Grenadier Guards 31st August 1908 and was discharged into the Reserves after three years service. He was mobilised as part of the Expeditionary Forces on 5th August 1914 – the day after war was declared. He was wounded in the leg in September 1916 and returned to the UK where he remained until he was again transferred to the reserves in June 1918. Abel Townsend, platelayer with the L & N W railway, was a relative newcomer to the village. He was born in Mixbury but his family had moved to Finmere before the 1891 census, and he had presumably set up home in Tingewick when he married. His daughter Beatrice had been baptised at the Wesleyan Methodist Chapel in October 1906. He was attested in December 1915 but was medically classified “B1” and kept ‘on reserve’ until March 1917, when he was finally posted to Egypt with the Railway Company, Royal Engineers, as a platelayer / sapper. He was transferred out in April 1919 with “Lumbago & Sciatica, following Dysentery (attributed)” – 40% disablement and awarded a pension – initially – of 11/- per week. He appears to have contracted Amoebic Dysentery in Palestine in October 1918, when he was admitted to hospital with diarrhoea and vomiting. The items in his possession on admission to hospital in Cairo were inventoried as: 1 pair drawers, 1 pair gaiters, 1 pair putties, 2 flannel shire, 3 pairs socks, 1 towel, 1 pair trousers, a fork, a holdall, a clasp knife and a table knife and a spoon, a haversack, boots with laces, braces, shaving and tooth brush, cap with badge, hair comb, tropical helmet, and razor in a case. His medical notes are also quite comprehensive – perhaps a little too graphic, considering his ailment, but fascinating as a window into that aspect of life in the Great War. They even include his temperature chart! William Ball, born 1881, enlisted in the Northamptonshire Regiment in 1903 and served in South Africa. In 1906 he married Martha Jane Stuchbury at Hillesden: she lived in Tingewick, and her daughters (Celia May and Ethel) were born there in 1903 and 1908. William served in France in 1914 and 1915: he was severely wounded / gassed on 25th September 1915 and was discharged 30 March 1916. WEDDING. — The marriage of Mr. John Tompkins, of Spring Cottage, Buckingham, with Mrs. F. Steeden, of Church View, Tingewick, was solemnised at the the Parish Church, on Wednesday, January 12th, the Rev. W.J.B. Hancock (curate) officiating. The bride, who was attired in navy blue, with bonnet to match, was given away by Mr. Atkins, of London. Her bridesmaids were Miss Steeden (daughter), and Miss Thompson (niece), and they wore dresses of light grey trimmed with red silk, with hats to match. 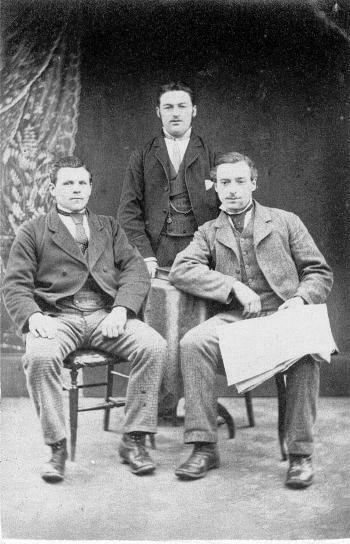 Mr. Thomas Bonner, of Buckingham, accompanied the bridegroom as best man. The guests included Miss Richardson, Mrs. Atkins, Mrs. Bonner, and Miss Alcock. Merry peals were rung on the bells during the day, and also at Buckingham, where the bridegroom was a ringer for over half a century. SOIREE. — An invitation soiree was again arranged this year, on the same lines as that held last year. Invitations were sent out by the Committee to a large number of persons in the village and neighbourhood, and about 90 responded to the invite, and put in an appearance at the Board Schools, on Friday evening, January 7th, the charge being 1/6 gents, and 1/- ladies. The Schools had been cosily arranged by the following Committee:– Mrs Richmond, Mrs. Hadland, Mrs. Barrett, Mrs. Lever, Miss Gomme, Miss Miller, Miss Thompson, Mr. Richmond (Chairman), Mr. Barnes, Mr. Woodman, Mr. Dudley, Mr. F. Hadland, and Mr. Goss, Mr. Stanley acting as Secretary, and they were very assiduous in their efforts to make the evening an enjoyable one. A long and varied programme had been arranged, including games, singing and dancing, and all were entered into with much spirit. During the evening, light refreshments were handed round at intervals. The Committee had secured the services of Mrs. Lever at the piano, which was kindly lent by Mr. Richmond, Mr. Judd with piccolo, and Mr. G. Neale with the violin. Several of the company had volunteered to sing, among these being Mr. J. Baker, Mr. G. Neale, Miss F. Barnes, Mr. E. Pollard, and Mr. G. Pollard, and altogether an enjoyable evening was spent. A meeting of the Committee was held on Wednesday evening last, when the accounts were presented, and showed a deficit of 1/7, which was paid out of the balance on last year’s account. The balance now in the Treasurer’s hands being 18/4. I have just heard from a Steeden descendant, fifth cousin (I think) to my daughter. She was enormously excited to be able to trace the family name back to 17th century Northamptonshire, using information from the Tingewick family group sheets. Certainly, I am confident that ALL the Steeden folk from Tingewick are descended from one couple – James Steeden and Sara Markham who married on Christmas Day 1770. Sara was Tingewick born and bred – baptised in October 1741, her parents were Thomas Markham (1716-1769) and Catherine Poulton (bur. 1752 at Tingewick). The Markham line is reasonably clear, linking back four more generations to the start of parish registers and beyond in Tingewick. James Steeden, though, was an incomer. According to the marriage register, he was from Charleton … but the next question is, which one? There are three obvious candidates – two in Oxfordshire and one in Northamptonshire – but my money is on the one in Northamptonshire. It’s now combined with Newbottle (which used to be the dominant hamlet) two miles east of Kings Sutton. When I visited the graveyard some years ago I found – not Steeden graves – but Markham ones in quantity. My main reason for linking the family to Chartlton/Newbottle, though, was finding (pre-internet search) what appeared to be plausible entries for the family on the old fiche-based IGI. Now of course I knew that the IGI was seriously flawed: but (for my sins) I built the hypothetical tree in my database which in due course grew into the Tingewick website. Do I still think the family came from Newbottle? I’m not sure. The old IGI entries I found have not been carried through to the modern, cleaned-up online FamilySearch IGI. But that DOES have a plausible baptism in 1745 in Bloxham – less than ten miles to the west of Charlton/Newbottle – and still with William as the father’s name. And I have found references in the London Gazette to the bankruptcy of a Daniel Steeden in 1845. He was a cattle dealer … the same trade followed by the Steeden families in Tingewick. Conclusive? No, but a straw in the wind.